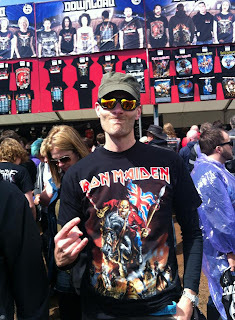 In 1992, I went to Donington Park to attend the Monsters of Rock. The lineup was The Almighty, Thunder, WASP, Slayer, Skid Row and Iron Maiden. If memory serves me correctly, Maiden were touring "Fear of the Dark" at the time. I was eighteen years old and was very excited to be attending such a big outdoor gig. I think I'd been to ZZ Top at the Milton Keynes Bowl the year before, but I was a metalhead, and the Monsters of Rock was the real deal. I remember being hit on the head by a flying plastic container probably filled with piss, and I remember the bands being amazing, but I don't really remember that much else about the day, to be honest. I think the driver's side window on my crappy Fiesta broke and I needed to hold it up with an elastic octopus thing (can you even still get them?). It was a brilliant day. Since then, I've been to something like ten or eleven Glastonburys (starting in 1993), one Reading (in 1994) and loads of other big outdoor gigs.... but I'd never been back to Donington. Twenty-one years after that first visit to the Monsters of Rock, me and some of the mates who accompanied me there, decided that the prospect of Iron Maiden playing their classic 1988 "Maiden England" set list was enough to drag us up the road to Download... which is effectively a rebranded Monsters of Rock turned into a festival of rock. Well... Seventh Son of a Seventh Son, the album they toured in 1988, was a landmark in our lives and we were keen to go back and watch it played live all over again. People tell me that Download is massive. Well, the festival is certainly a lot bigger than in 1992, and there are three stages now instead of just the one, but any Glastonbury veteran will tell you that the whole area is little bigger than the field above the Pyramid stage. Apparently something like 100,000 people were there on Saturday, but you wouldn't really know it from looking around: there are no queues for beer (or for beer tokens. Whose stupid bloody idea are beer tokens?) unless you want to buy a bottle of the Iron Maiden beer, "Trooper". I don't, so we walk straight up to the bar and get out drinks. The crowd is obviously pretty different to Glastonbury too: Iron Maiden have been together for 38 years, and Lemmy is now 67 years old, so this is hardly a lineup to draw the young, is it? We're definitely not the oldest people there, which is nice. I like metal crowds. 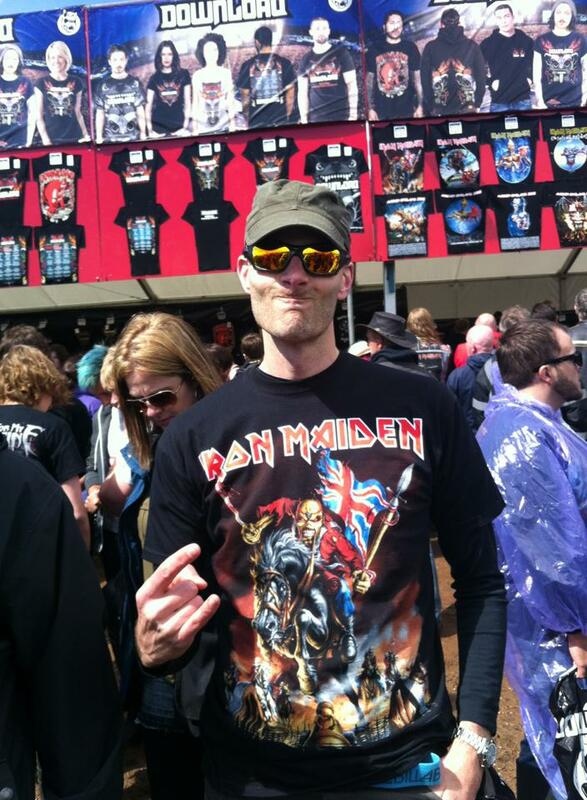 Unlike Glastonbury, no one is here for fashion reasons, and I think metal fans are generally really nice and considerate people. The site is a lot cleaner, for one thing, with noticeably less litter than accumulates at Glastonbury. The vibe is pretty good-natured too. I do see a guy wearing a full-length green military greatcoat and peaked hat, accessorised with a zombie mask whilst carrying a severed arm. Maybe these people take all their aggression out in the music they love and not anywhere else? It's a happy crowd. We get into the site at about 13:30 and make a bee-line for the band whose name immediately caught our eye on the bill: Nekrogoblikon. They sound pretty much exactly how you would imagine, although quite how they managed to get a rave keyboardist is a bit of a mystery. I've never seen someone quite so out of place in a band. They're pretty full on, but have the best name in the history of music, so really we had to have a look. The weather is pretty windy with some incredible downpours, so Mastodon just sort of sound soggily in the background as I eat an entirely excellent mixed shwarma wrap. Alice in Chains are excellent. Their original singer, Layne Staley died in 2002, but Jerry Cantrell is still in place, and replacement singer William DuVall is more than just a stand-in. 1992s "Dirt" is outstanding and sounds brilliant live today as the band open their set with "Them Bones". They're generally classified as a grunge band, but those riffs are properly heavy and they certainly don't sound out of place. 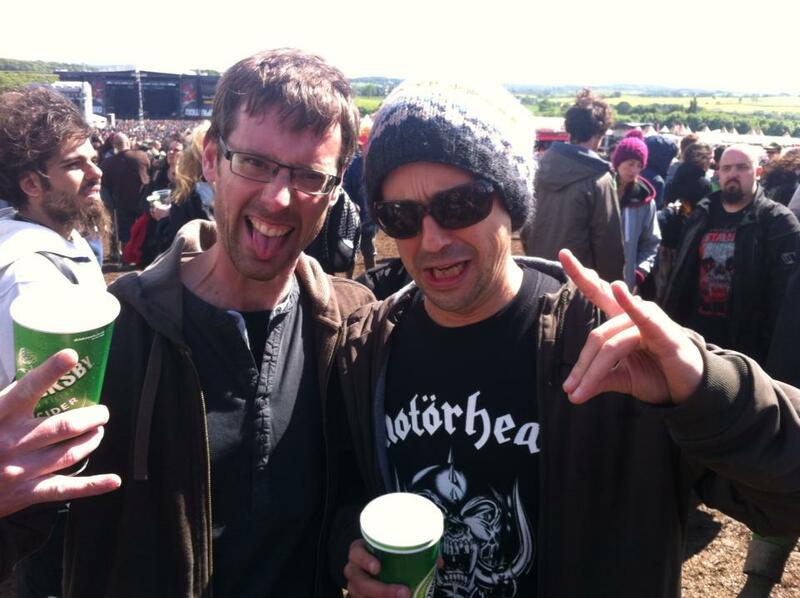 Speaking of heavy riffing bring us nicely to Motorhead. We were trying to work out how many of their songs we could actually name, and I think between us we came up with about three. Let's be honest, they're pretty much all about "Ace of Spades", aren't they? But if they're a one-trick pony, then that's one hell of a trick. I reckon they could have played that ten times in a row and the crowd still would have cried out for more. It's an incredible song and Lemmy is an absurdly iconic figure. Everything louder than everything else, indeed. Queens of the Stone Age are a funny band in many ways: there aren't many acts who could play to festivals at all ends of the musical spectrum, but QotSA are definitely one of them. They certainly know their way around a riff, that's for sure and don't sound in the least bit out of place at a heavy metal festival (although I notice that they don't wheel out Elton John, who features on their new album). That new album is strong, but much of the set is taken from "Songs for the Deaf".... which is fine by me as it's an incredibly good record. They sound good, but for me Josh Hommes' "thank you so much"s after every song is the sound of a man going through the motions somewhat. I can't help but think that it's just another festival to him, and that takes the edge off their set for me. They're good, but I'm looking for a bit more of an emotional connection today. Emotional connection? Well, tonight's headliners have that nailed How do bring the curtain down on a day like this? Well, if you're Iron Maiden, it's easy. How about a flyover by an actual Spitfire before taking to the stage? Yeah. That's not too shabby a way to start a gig, is it? still, this is a band that have seen it all before. This is the fifth time that Iron Maiden have headlined Donington, and coincidentally this is also the fifth time that I've seen the band. They're brilliant. Of course they are. They're certainly ridiculous: Bruce Dickinson is 54 years old now, and that's not really an age where it's all that dignified to be dressing up as a British soldier in the Crimea and charging around the stage singing about Satan, is it? Is it? Well... it's not a bad way to make a living. I'd do it! 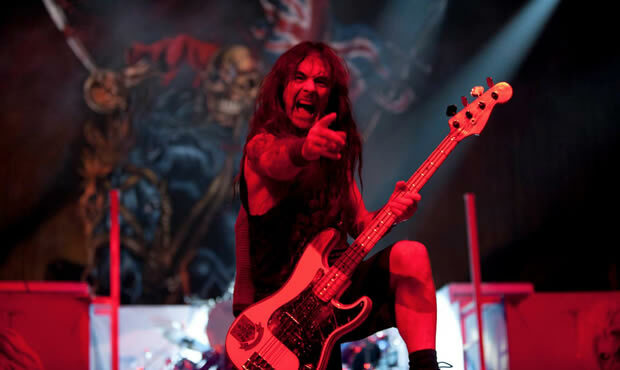 SCREAM FOR ME, DONINGTON! See? Easy! Truth be told, this isn't too different a set to the one they played when I saw them last at Twickenham a couple of years ago. I really don't care and I don't think anyone else in the crowd really does either. It's windy and cold and the sound drifts a bit, but it really doesn't matter. 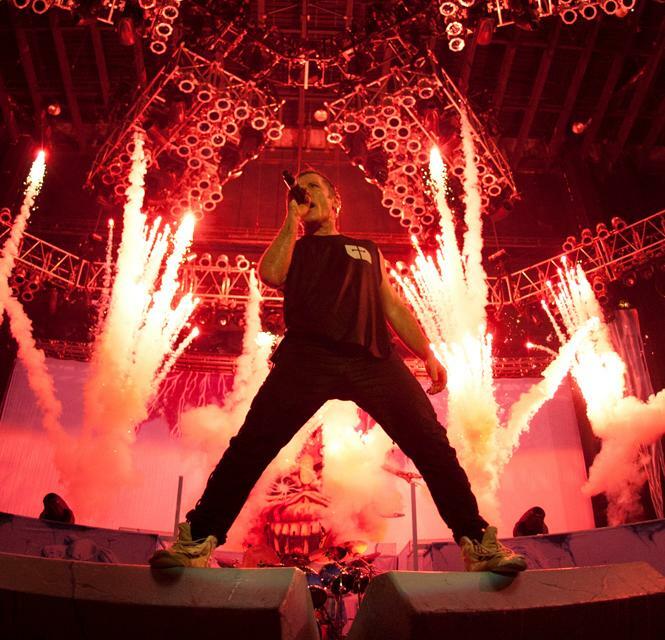 It's Iron bloody Maiden! They've played a pivotal part in my discovery of music and I love them to bits. I used to have their posters on my wall, and at Download, I bought a t-shirt. It features a zombie; on horseback; waving a bloody sabre and a British flag charging down a cannon. It's silly. Well, they are a somewhat silly band (at one point we had a giant Eddie dressed as a US cavalryman during "Run to the Hills", chasing the band around the stage). Who cares? The ten year old I saw at Sainsburys the day after the gig thought my t-shirt was amazing. So do I. It was a brilliant day out with some of my oldest friends, a few beers and one of our earliest shared musical loves. If Glastonbury has anything as good as this then I'll be a very happy man indeed. In fact, you could replace any band on the bill at Glastonbury - including the Rolling Stones - with Iron Maiden and I'd be delighted. Fantastic day. A spitfire flyover, for goodness sake. You had me at hello. Not sure if John's giving the sign of the Devil in that photo or practising his 'Rabbit' in the not-so arcane art of shadow puppetry! ...in a bid to become Master of Puppets perhaps?